While prices in the state or region reflect the typical rate, local market conditions are more consequential. Case in point: if your timber grows near several mills, it may command a higher price than if it were located further away from those mills. The value of a timber depends on the species, size and quality of the trees. It also relies on the amount of timber sold in a single sale, as well as the type of done. Quite often, the larger the sale, the lower the price per unit of wood. Conversely, it's usually more costly to cut down just a few units. Timber prices also depend on , which affect the cost to remove and transport timber to a mill. Variables include the distance from the stand to the nearest road, slope and soil wetness. 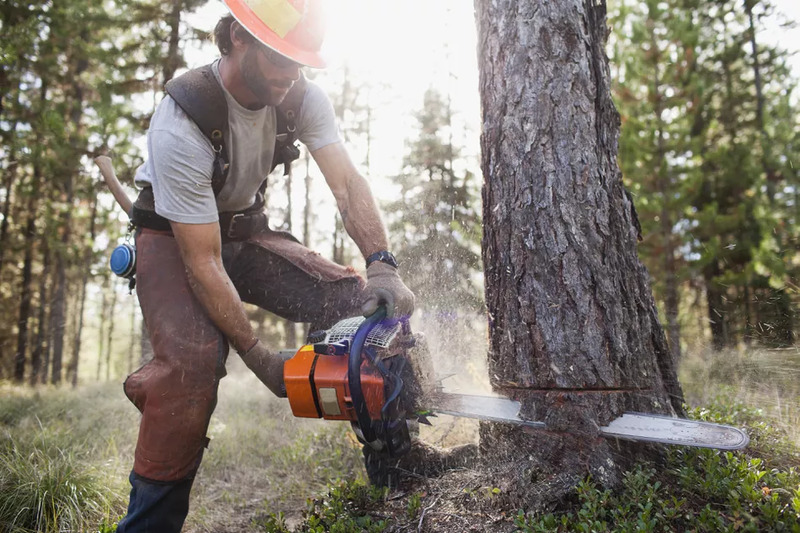 To research lumber prices, contact your state service forester, who works with the state Department of Natural Resources Division of Forestry or Forestry Commission. Also visit the , which can link you to state service forestry agencies. Contact your county Agricultural Service agent or Forestry Extension staff--typically located at your state's Land Grant university, in the Forestry Department. Finally, consult the for forestry assistance. Sample Calculation: Say you wish to determine timber prices for red oak on the stump. You call area sawmills and determine the average price for red oak grade lumber is $800 per thousand board feet (bf). You also learn that harvesting cost is $100 per thousand bf, trucking is $100 per thousand bf, and milling is $250 per thousand bf. You then take the $800 and subtract $450 in costs, to arrive at $350 per thousand board feet. Before offering $350 per thousand for red oak, factor in profit, by adding 50% to 70% to your cost figure. For example ($450 x 1.5 = $675 per thousand bf) or ($450 x 1.7 = $765 per thousand bf). Therefore, the price range you can pay for red oak on the stump is $35 to $125 per thousand board feet, based on your cost figures. Finished Products (Lumber): By-products, residual chips, shavings, sawdust, bark/hog fuel. Variable Costs: Log cost, log yard (inventory) cost, sawmill operating costs, labor, drying, planning, shipping, maintenance cost. Fixed Costs: General and administrative costs, log procurement (staff), sales/staff, depreciation, interest, corporate fees. The tcwoods.com website also explores calculations based on different thickness, widths, and lengths of lumber. Determining timber prices can be a complicated process. It may be best to start off buying your logs from a logger who will give you a price for the logs you need shipped directly to your mill.